Sat., Oct. 20, 2018, 10:37 p.m.
LOS ANGELES – Jeff Skinner scored three goals for his fifth career hat trick and the Buffalo Sabres’ reconfigured top line keyed a 5-1 win over the Los Angeles Kings on Saturday. 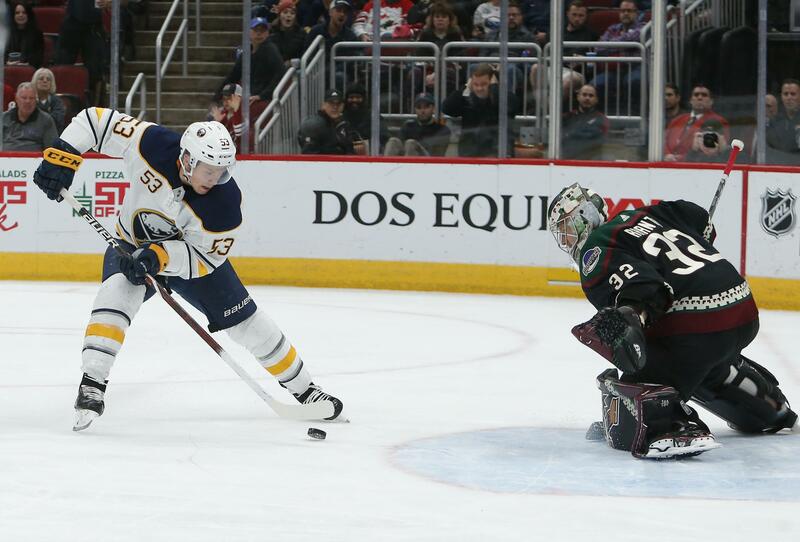 Jason Pominville had a goal and two assists to reach 700 career points, and Jack Eichel added three assists after Sabres coach Phil Housley shuffled his lines in an effort to revive an offense that was held to one goal in three of the past four games. Zach Bogosian also scored and Linus Ullmark made 19 saves for Buffalo. Drew Doughty had a goal and Jonathan Quick made 21 saves for the Kings, who lost their fourth straight game. Quick has allowed 10 goals on 54 shots in two starts since returning from a lower-body injury. RALEIGH, N.C. – Gabriel Landeskog scored twice to give him six goals in three games, Nathan MacKinnon added a goal and two assists and Colorado beat Carolina. Landeskog, fresh off a hat trick against New Jersey, opened the scoring late in the first period and added another goal midway through the second. His seven goals through eight games this season are tied for third most in the NHL. MacKinnon scored late in the third and assisted on both of Landeskog’s goals for the Avalanche. Philipp Grubauer stopped 42 shots. Micheal Ferland scored and Curtis McElhinney made 19 saves for the Hurricanes, who have lost three straight after a 4-0-1 start. Carolina outshot Colorado 43-22. The Hurricanes have outshot their opponents in all three games during their losing streak. PHILADELPHIA – Jake Voracek had a goal and had two assists, and Philadelphia played some solid defense to beat New Jersey. Voracek, who was demoted from the Flyers’ top line, took a loose puck at center ice and kept it himself on a 2-on-1 breakaway, beating Keith Kinkaid for his third goal of the season to put the Flyers ahead 3-2 with 3:10 remaining. Travis Konecny and Nolan Patrick also scored, and Scott Laughton and Wayne Simmonds added empty-net goals for the Flyers, who limited the Devils to just 21 shots. Philadelphia had allowed four goals or more in five of its first seven games. Brian Elliott, who was pulled after giving up four goals to the Florida Panthers last Tuesday, bounced back to make 19 saves and earn his second win of the season. Damon Severson and Brian Boyle scored for the Devils, who have lost two straight games after winning their first four. Kinkaid made 16 saves. WINNIPEG, Manitoba – Three Jets scored their first goals of the season, defenseman Jacob Trouba had three assists and Winnipeg beat Arizona. Tyler Myers, Josh Morrissey and Mathieu Perreault each found the net for the first time. Adam Lowry scored his fourth of the season and Blake Wheeler added an empty-netter. Backup goalie Laurent Brossoit stopped 42 shots for his second victory in two starts as the Jets improved to 3-0-1 on their six-game homestand. Clayton Keller scored twice and Christian Fischer had a goal for Arizona. Antti Raanta made 27 saves for the Coyotes, who haven’t won in Winnipeg since the Jets moved from Atlanta to Manitoba in 2011. COLUMBUS, Ohio – Patrick Kane had two goals and an assist, Corey Crawford stopped 37 shots to get his first win in nearly 10 months, and Chicago beat Columbus. Alex DeBrincat and Marcus Kruger also scored for the Blackhawks, who earned a point for the sixth time in seven games (4-1-2). Crawford was playing his second game since a concussion suffered in a win at New Jersey last Dec. 23. Kruger put the Blackhawks ahead for good when he tipped a wrister from Alexander Fortin past Bobrovsky at 7:43 of the third. Kane then scored twice 2:37 apart. TORONTO – Ryan O’Reilly scored his first goal with St. Louis, and Jake Allen made 22 saves to lead the Blues. Robert Bortuzzo, Zach Sanford and Ivan Barbashev also scored, and David Perron added two assists as St. Louis picked up its second victory in seven games this season. Morgan Rielly scored for Toronto. Frederik Andersen stopped 21 of 24 shots as the Leafs dropped consecutive games after five straight wins. Toronto had scored an NHL-high 33 goals in seven games to open the season. But the Maple Leafs were shut out by the Pittsburgh Penguins on Thursday and were scoreless in two periods against the Blues, going 116 minutes 37 seconds without a goal until Rielly cut the deficit to 3-1 early in the third. SUNRISE, Fla. – Gustav Nyquist scored 3:44 into overtime to lift Detroit to its first win of the season. Dennis Cholowski had a goal and an assist, and Thomas Vanek and Dylan Larkin also scored for the Red Wings, who were 0-5-2 in their first seven games. Jimmy Howard stopped 34 shots. On the winner, Nyquist grabbed a loose puck and his shot from the slot beat goalie Michael Hutchinson on the left side. Trailing 3-2, Florida’s Mike Hoffman tied the score with 1:16 left in the third as his shot from the left circle went between Howard’s pads. Nick Bjugstad had a goal and an assist, and Keith Yandle also scored for the Panthers, who played into overtime for the fourth time in their six games. Hutchinson finished with 27 saves. OTTAWA, Ontario – Mark Stone scored his second goal of the game 2:30 into overtime and Ottawa rallied from a two-goal deficit. Stone’s one-timer from the face-off circle beat Carey Price for the winner. Stone had a goal and an assist in regulation, while Mikkel Boedker and Matt Duchene also scored for the Senators. Craig Anderson made 24 saves in the win. The Canadiens got first-period goals from Paul Byron, Max Domi and Phillip Danault. Price made 30 saves. ST. PAUL, Minn. – Mikael Granlund scored 3:43 into overtime to lead Minnesota. Charlie Coyle, Marcus Foligno, Zach Parise and Jason Zucker all scored in regulation as the Wild rallied again in the third period. Alex Stalock made 27 saves for Minnesota, which has allowed the first goal in six straight games but is 4-1-1 in those contests. Yanni Gourde and J.T. Miller each had a goal and assist for Tampa Bay, which lost in its first road game of the season. Ryan Callahan scored his first of the season for the Lightning and Anton Stralman pushed the game into overtime with his first goal of the season with 4:58 left in the third after the Wild took their first lead of the game. Andrei Vasilekskiy made 29 saves for Tampa Bay, which had it’s three-game winning streak snapped as it played on the road after a season-opening, five-game homestand. VANCOUVER, British Columbia – Bo Horvat scored at 3:12 of overtime and Vancouver edged Boston. EDMONTON, Alberta – Juuse Saros made 31 saves in the shutout, and Nashville ran its winning streak to five games. The Oilers had a three-game winning streak halted. LAS VEGAS – Marc-Andre Fleury stopped 17 shots to lead the Golden Knights to their third straight win. Fleury got his 408th career win to move into sole possession of 10th place on the NHL’s all-time wins list. The 15-year-veteran has allowed just two goals in his last three starts. SAN JOSE, Calif. – Brent Burns scored San Jose’s first goal from a defenseman this season and Logan Couture scored his fourth goal in two games to lead the Sharks. Timo Meier and Joonas Donskoi also scored to help the Sharks wrap up a brief two-game homestand with a second straight win and avenge a 4-0 loss at the Islanders earlier this month in a game that got testy down the stretch. Martin Jones made 24 saves to earn his second straight win after opening the season with three regulation losses in his first four starts. Brock Nelson scored the lone goal for the Islanders, who finished a road trip 1-3. Robin Lehner made 37 saves after shutting out San Jose on Oct. 8. Published: Oct. 20, 2018, 10:37 p.m.